I turn 65 next month, and will begin Medicare. Because it wasn’t an urgent procedure, I decided to postpone this past week’s gastro endoscopy exam until next month because having both Medicare and military insurance coverage (the supplemental) means there will be very little to no out-of-pocket expense. If I had had it done this past week as scheduled, we would have had to pay several hundreds of dollars in co-pays (20% of total costs, and the procedure is expensive on Kaua’i). I sent Wellesley College’s financial aid office a statement showing the past two years of my student loan payments – they will reduce our family financial obligation. Our six-month supply of toilet paper arrived this past week from Amazon. 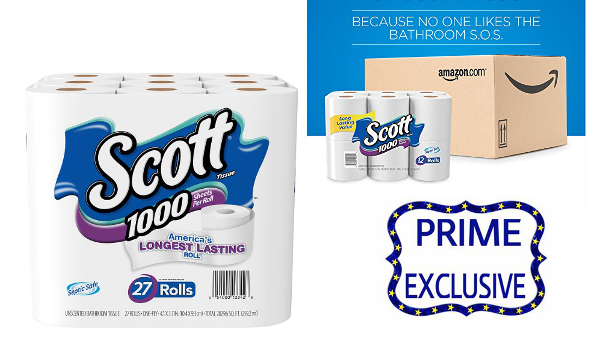 By ordering through Prime (free shipping) and using subscribe & save, we pay just 56¢ per roll versus buying at Costco, the least expensive option on the island (73¢/roll). Every little bit of savings helps. Even with being gone around one-third of March, I still managed to earn 417 bonus Swagbucks, nearly enough again for another $5 in Amazon credit. I make a point of earning my “small goal” every day, which increases my bonus total every month. We had no food waste this past week. YaYu took leftovers every day for her lunch, and Brett and I ate the rest for our breakfasts and lunches. We always store our leftovers in Pyrex glass containers so we can see what needs to be eaten. Next Post Japan Giveaway #2: Keep Entering! That photo of the Scott tissues caught my eye so you can well imagine my surprise to read that it regarded a 6-month supply! I’m not subscribed to Amazon Prime (it’s just not necessary for only a family of 2), but when I come across good deals (like our favorite brand of coffee), I always make a point to nab it right away. I know how expensive toilet tissue is over there…good money constantly going down the drain! LOL! When the girls still lived at home, we had to order a case every four months. We’ll go back to Costco after YaYu heads off to college. Our mail carrier asked about the price, and told he us now orders his family’s TP from Amazon as well! Well, I have so NOT met my $5.00 daily earnings goal this week (thats between swagbucks, I botta, shopkick and the occasional target gift card), but my new goal is simply to make my first swagbucks goal daily and then add the rest of the money elsewhere. Interested in what you think of Amazon Prime. One of my things for spring is to make a list of regularly bought items, and stores we use in order stock up and buy in bulk. Earning that first Swagbucks goal is key – if you can do it every day it adds 300 points! Add on the bonus points you earn and it can add 600 Swagbucks to your total. So, that’s my goal every day. If I get the second goal, great but no big deal if I don’t – I don’t stress over it. Amazon Prime is a lifesaver here on the island – we’d be lost without it. The service has been great as well – we have no complaints. So many things are so expensive here, or unavailable, and we’ve been able to get them via Prime. We even bought a chair for our living room through Amazon Prime! We buy several bulk items from them, and can find the rest at Costco here. Bulk buying is the only way to keep our food budget manageable. I also like having Prime for video; lots of free movies and TV shows for streaming (like all the Ken Burns documentaries, which I love). I can think of three: 1) Got 10% discount for the bin rental for my parents’ move 2) Got two free mattress covers from the moving company, value at $40 and 3) No food waste. Nice job – I never heard of 6 months of TP supply haha. It pays to buy in bulk! My frugality for the week I guess was finding a free filing cabinet next to the road! One hotel was remodeling and they put the old furniture out on the side of the highway – it was all gone in less than an hour, but that’s all I’ve ever seen for free here. Otherwise, nothing is free here except the beach, the mountains and the weather! Bulk buying is the only way to keep costs down here, both for food and supplies. One of the smartest things we did was bring along our small freezer – we stock up once a month at Costco and it’s been a lifesaver for our budget.